On the Road…Again tour kicks off this week! James is ready to get ‘On the Road…Again’ with his brand new tour. Packed with fun, food and friends it promises an evening to remember! 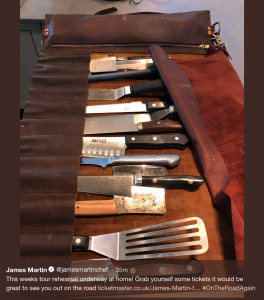 James has shared some sneak peeks via social media and revealed exciting details to Sara Cox on BBC Radio 2 but to get the full experience you need to be in the audience! There’s an amazing prize draw taking place to win two tickets to the tour at a venue of your choice along with a signed copy of James’s latest American Adventure book. Head over to Facebook to enter. If you want to join James on the road there are still a few tickets available for the 22 date tour, visit ticketmaster to get yours!